We are registered under the Data Protection Act 1998 and as such, any information concerning the Client and their respective Client Records may be passed to third parties. However, Client records are regarded as confidential and therefore will not be divulged to any third party, other than [our manufacturer/supplier(s) and] if legally required to do so to the appropriate authorities. Clients have the right to request sight of, and copies of any and all Client Records we keep, on the proviso that we are given reasonable notice of such a request. Clients are requested to retain copies of any literature issued in relation to the provision of our services. Where appropriate, we shall issue Client’s with appropriate written information, handouts or copies of records as part of an agreed contract, for the benefit of both parties.We will not sell, share, or rent your personal information to any third party or use your e-mail address for unsolicited mail. Any emails sent by this Company will only be in connection with the provision of agreed services and products. We will not undertake any work before the item has been examined, the repair price and the turnaround time are verified by us and you agree the quotation and want us to proceed with the repair. We reserve the right to change the quotation for any unforeseen work and damaged parts which may be required to complete a repair We give quotation for online/tele repairs with the provided information. The accuracy of the online/tele estimates relies on the accuracy and quality of information given to us by you. We reserve the right to change the quotation once we receive and do our initial examination. We will notify you when the repair is ready for collection via tour telephone number initially given with the repair. 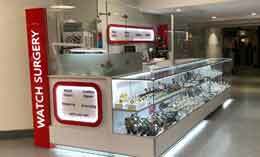 We reserve the keep your items till you make the agreed full payment for the repair. We reserve the right to sell your uncollected repairs after a period of 3 months to recover any money owed for the service or repair. It is your responsibility to choose suitable methods of postage that will ensure safe delivery and adequate compensation in the event of loss or damage. We cannot be held responsible for any goods lost or damaged in transit to us. You are responsible for all postage and packaging costs incurred either to or from us. We offer one year warrantee for our service/repair work. This warrantee only protects you against defects arising from the service or repair undertaken. This guarantee does not cover accidental damage, misuse or a component not fitted during the service or repair and becomes invalid if any other watch company opens up the watch. All postage/travel costs incurred to the customer are non-refundable. Watch straps, bracelets or glasses are not covered by any guarantee. All Service and Repair guarantee's are valid from the date the repair was completed.